For a billion years this Earth has teemed with life. Nature has crafted innumerable species—and thousands more have been shaped by the prior worlds. 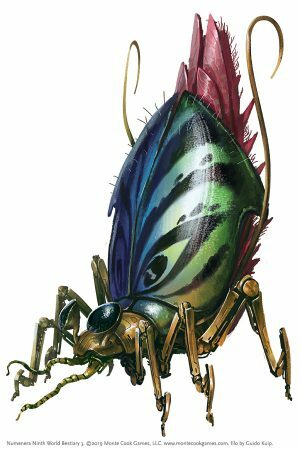 There is no end, it seems, to the variety of life to be encountered in the Ninth World. And all of it is interesting, usually weird, sometimes creepy—and often very, very dangerous. 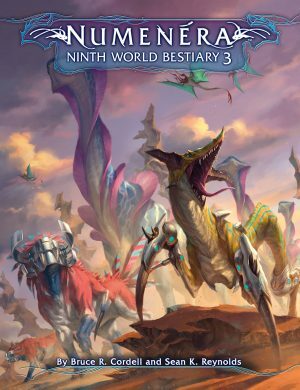 The Ninth World Bestiary 3 brings over 150 new, lavishly illustrated Ninth World creatures and characters to life. Innovative features such as size comparison diagrams, one-creature-per-page layout, and heavy cross-referencing make this book a joy to use, whether at the game table or while prepping your adventures. 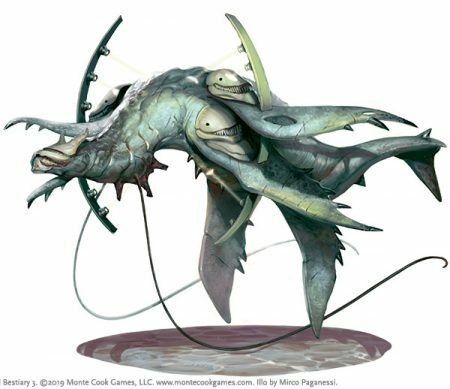 And it includes encounter tables featuring creatures from the Numenera Discovery and Numenera Destiny corebooks, plus all three Ninth World Bestiaries, making it easy to look up creatures from every major source. The Ninth World Bestiary 3 comes with double-sided poster map featuring a creature comparison diagram on one side, and the stunning cover art on the other.